Black bears, elk, and deer. Historic pioneer cabins. World-famous hiking trails. Even a working grist mill. You'll find all this and more at Cades Cove, one of the most-visited destinations in the Smokies. Located just 27 miles from Gatlinburg and 31 miles from Pigeon Forge, this 6,800-acre valley boasts breathtaking scenery, a rich, storied history, and an abundance of wildlife. Best of all, it offers multiple ways to enjoy its memorable sights. New to Cades Cove? 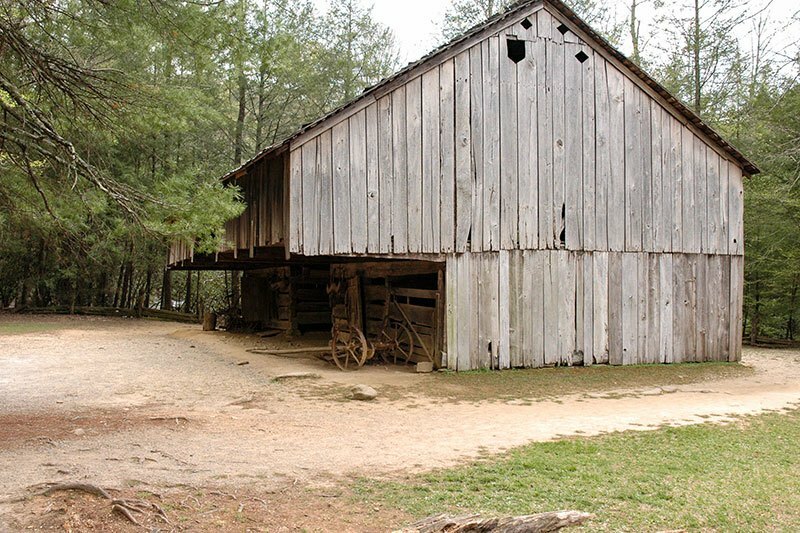 Drive the 11-mile Cades Cove Loop to view some of its legendary attractions. This paved one-way road winds around lush wildflower meadows dotted with 19th-century homes, all against the backdrop of the magnificent Smoky Mountains. Because the Loop is one-lane, travel is slow, but that's just the way visitors like it! Give yourself two to four hours to complete the circuit. Plus, plan on stopping now and then for an up-close look at a pioneer cabin or a flock of wild turkeys. The Loop offers many spots where you can park, get out, stretch your legs, and enjoy the views. About half way 'round the Loop, you'll find the Visitors Center, where you can pick up self-guided tour booklets, get info on Cove history and wildlife, and snap photos of local scenery. 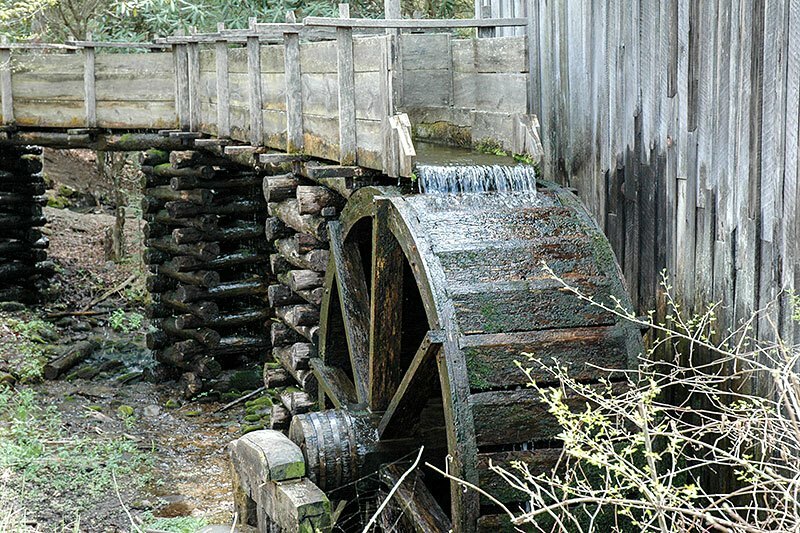 Nearby you'll find a water-powered 19th-century grist mill, still in full working order! Prefer to bike or walk? On Wednesdays and Saturdays, from early May through late September, the path is closed to motor vehicles until 10 a.m. That's your golden opportunity to stroll or cycle the Loop during the fresh early-morning hours. Who knows? You may spot a black bear or a white-tail doe with her fawns. Open from sunrise to sunset, the Loop is accessible via Laurel Creek Road, Rich Mountain Road, or Parson Branch Road. The famous cantilever barn at the Cable Mill display. This distinctive 19th-century structure features an overhanging upper story, designed to shelter livestock and farm equipment from sun, wind, and rain. The Cades Cove Primitive Baptist Church, first founded in 1827 and housed in its picturesque white-frame building from 1887 on. The Dan Lawson Place, built around 1856 and featuring some of the region's finest original woodwork, along with a rare "homemade" brick chimney. Cades Cove offers exclusive access to the head of Abrams Falls Trail, a 5-mile mountain trail featuring a breathtaking waterfall with a 20-foot drop to a sparkling pool and stream. Prefer the road less traveled? Hike the 8.5-mile Rich Mountain Loop Trail, accessible from the entrance to Cades Cove Loop. In spring, this scenic trail offers splendid views of the Cove's famous wildflowers. From rustic cabins to luxury log homes, you have options galore in the Gatlinburg-Pigeon Forge area. Contact us today to reserve your perfect getaway.